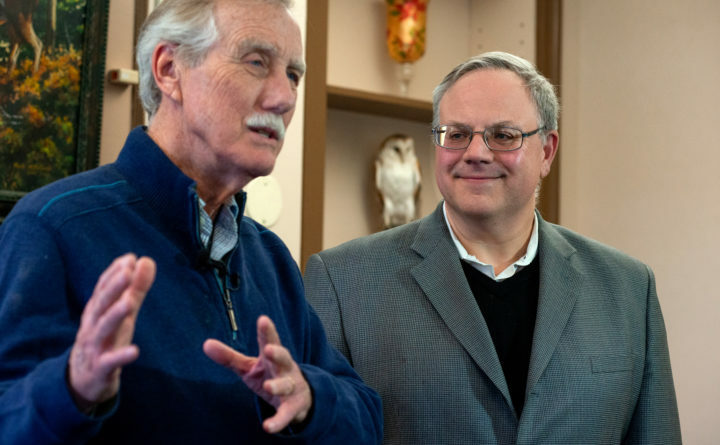 Department of Interior Acting Secretary David Bernhardt and Senator Angus King speak to the press Friday morning at the Department of Inland Fisheries and Wildlife in Bangor. “There’s some details in the management plan to be worked out, but in terms of the existence of the monument and the fact that it’s part of the National Park Service, the best evidence of that that I can give is there’s a line in the budget that the president submitted last week [that says] Katahdin Woods and Waters,” King said. Bernhardt, who has not yet been confirmed, made a brief statement to the media but did not field questions. 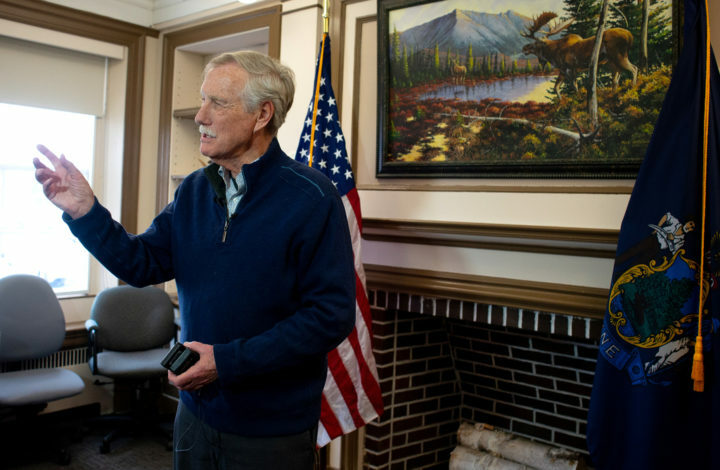 Sen. Angus King answers questions at a press conference Friday morning at the Department of Inland Fisheries and Wildlife in Bangor. Bernhardt had two meetings over 2 1/2 hours Friday at the Maine Department of Inland Fisheries and Wildlife building in Bangor. One dealt with the national monument, and another focused on projects that need to be tackled at Acadia National Park. Each meeting focused on plans for the future, according to King. A comprehensive plan for KWW was one topic of discussion, as was an Acadia transportation plan. King said Bernhardt spent Thursday touring parts of Acadia National Park that are accessible during the winter. 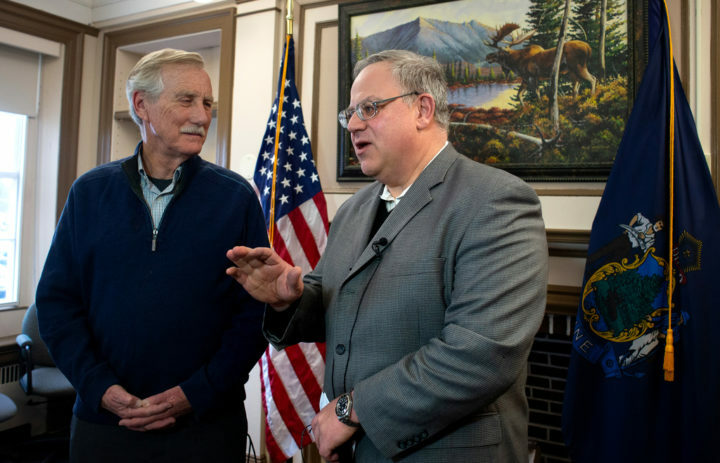 Department of Interior Acting Secretary David Bernhardt and Sen. Angus King held a press conference Friday morning at the Department of Inland Fisheries and Wildlife in Bangor. King said the KWW discussion included some business owners from the region. Also on hand was Lucas St. Clair, whose mother, Roxanne Quimby, bought the land that was donated to the federal government in order to form the monument in 2016. King said he and Bernhardt talked about “uncertainties” that had arisen when KWW was included on a list of national monuments that might be scaled back or eliminated early in the Trump administration. 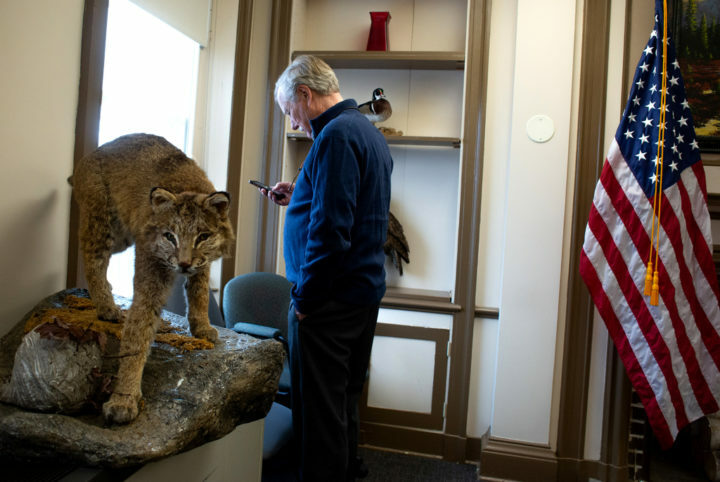 Sen. Angus King spends a few moments on his phone before a press conference with Department of Interior Acting Secretary David Bernhardt Friday morning at the Department of Inland Fisheries and Wildlife in Bangor. “We had a very productive meeting. We talked about what the questions are that need to be resolved in the management plan, and I’m feeling very positive that we’re going to be able to move forward both at Katahdin Woods and Waters and at Acadia,” the senator said. The management plan for KWW has been in the works for three years and is nearing its completion, King said. Trump nominated Bernhardt earlier this year to be interior secretary after former Secretary Ryan Zinke resigned in the wake of several investigations into his business and personal dealings. Bernhardt has been criticized by some environmental groups because of his former job as a lobbyist who represented oil interests.